AIIMS MBBS Admit Card 2018 - Check AIIMS MBBS Entrance Exam Call Letter 2018 - www.aiims.exams.org. 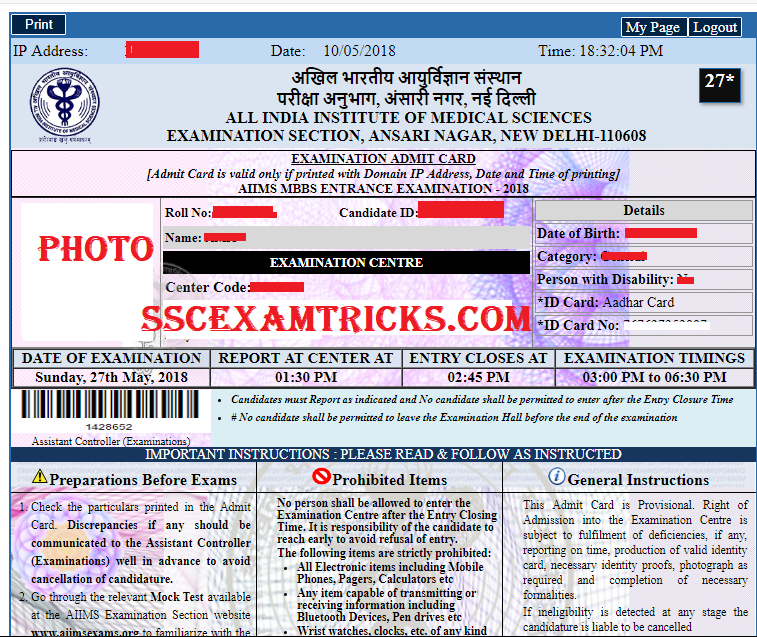 Latest News (09.05.2018) - AIIMS MBBS Admit Card 2018 has become available now. AIIMS will release online Admit Card about 15-18 days before exam to be held in Saturday 26th May, 2018 & Sunday, 27th May, 2018 at various centers about 155 cities all over India for admission to MBBS Course Session 2018-19. Those candidates who had applied for these posts and waiting for their AIIMS MBBS Call letter 2018; they can download it from direct link given at the end of the page. It is informed to all the aspirants that AIIMS has released notification for admission to MBBS Courses. Eligible and interested candidates can apply online up to last date 5th March 2018. The final selection will be made by evaluating performance in written test (CBT). Those candidates who have been waiting for this Admission can apply online from the link and steps given here. · Purpose: To get admission in reputed and renowned Medical Colleges in Medical Course in all over the country. Pen, Pencil, Paper(other than the Admit Card, Photo ID and Photograph as mentioned), calculators, bags, bottles etc. Any other item/ instruction/ decision as may be considered necessary to be prohibited by AIIMS or its representatives at the centre for proper and fair conduction of the examination. Every Correct MCQ Answer carries ONE mark (+1) while for every Incorrect Answer ONE-THIRD will be deducted (-1/3). NO marks (0) will be awarded or deducted for unanswered questions. All Answers that have been marked for “REVIEW” and NOT SAVED are CONSIDERED as UNANSWERED and will not be marked. · A valid e-mail ID. Scanned Passport size photograph of candidate (in JPG format). Online payment details of the required Application Fee. Any other details please read the advertisement before proceeding to fill online application form. The Admit card will be available on official website of AIIMS 2019. 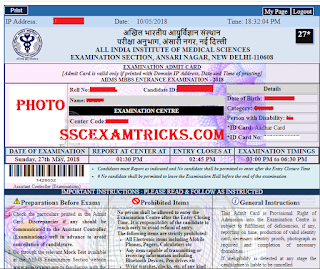 Those candidates who have applied for this post and are waiting for their online admit card,; they can download or check the related latest information from the link given in the below table.